How believers use their resources — time, money, talents, and attention — is a reflection of what they believe about God and God’s actions in the world. Furthermore, how those resources are used preaches a message to others. Paul wants the Corinthians’ actions to be a reflection of the gospel in which they believe. Before he resorts to shaming them directly, he reminds the believers that their actions to support the Jerusalem poor demonstrate the earnestness of their faith (2 Corinthians 8:8). Paul reframes the whole collection as the gospel enacted. In 2 Corinthians 8:9, Paul retells the good news through the lens of generosity. Christ gave up extraordinary riches so that others might receive the abundant wealth of God’s grace. 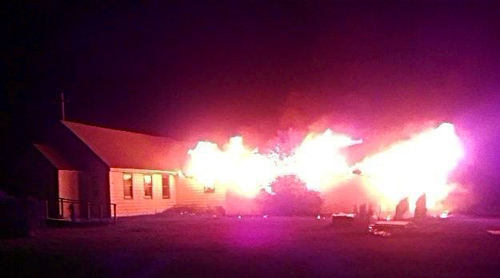 A July 25 nighttime fire has destroyed St. James’ Episcopal Church in Cannon Ball, North Dakota. I propose that we take up a collection in the Sunday Morning Forum for the people of St. James Episcopal Church. With the Apostle and the with the Professor I believe that how we use our resources tells a lot about what we believe about God and God’s actions in the world. More information about St. James in Cannon Ball, ND and about the Standing Rock Episcopal Community of North Dakota. I remind you: we’re in this together. Thank you, Father Dan, for your drawing attention to this church succumbing to flames…..what a tragedy!! North Dakota is my home state and I didn’t know of the fire until I read it here. Thank you for your continued efforts to bring the needs of the world into the church! Cherry: you’re welcome. Forum members seem ready to contribute to the rebuilding of St James. Meanwhile, we are praying for the congregation and the community. Next Next post: Seven, ten, or thirteen? Scholars are still deciding.